Expedition 30/31 crew members from left: NASA Flight Engineer Don Pettit, Soyuz Commander Oleg Kononenko and European Space Agency Flight Engineer Andre Kuipers are seen following a press conference held at the Cosmonaut Hotel on Dec. 20, 2011, in Baikonur, Kazakhstan. Three spaceflyers who launched on a Russian rocket Wednesday (Dec. 21) are preparing to dock at the International Space Station tomorrow (Dec. 23), just in time for the holidays. 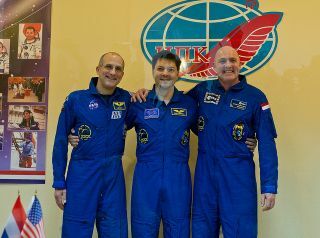 NASA astronaut Don Pettit, Russian cosmonaut Oleg Kononenko, and Dutch astronaut Andre Kuipers of the European Space Agency (ESA) are due to join the long-duration crew of the orbiting outpost for about five months. The trio lifted off atop the Russian Soyuz TMA-03M spacecraft from the snowy Baikonur Cosmodrome in Kazakhstan at 8:16 a.m. EST (1316 GMT) on Wednesday. They are expected at the space station on Friday at 10:22 a.m. EST. Waiting aboard the station are commander Daniel Burbank of NASA and Russian flight engineers Anton Shkaplerov and Anatoly Ivanishin. The new arrivals will return the space station's crew size back to its full six-person complement. "Our planet is so beautiful, peaceful and serene when you look at it from space — the most beautiful holiday card you could imagine," Burbank wrote Dec. 17 on the astronaut blog Fragile Oasis. He and the other station residents have been setting up holiday decorationsand preparing for a big feast of space food after their crewmates arrive. Though there will be Christmas cheer, the astronauts aren't expecting any gifts to arrive with the incoming Soyuz. "In terms of gifts, when you're off in the frontier, you're not going to waste upmass on something like that," Pettit told SPACE.com in a preflight interview. "These holidays become matter of fact. My family gets to experience Christmas at Baikonur." The new crewmembers also won't have too much down time, as their schedule is packed with research and space station upkeep work. They also plan to host the first visit of a commercial spacecraft to the orbiting laboratory. In February an unmanned SpaceX Dragon spacecraft will launch on the company's Falcon 9 rocket, carrying a haul of cargo to the space station. It will be the second orbital flight of Dragon, and the first to the outpost. When it approaches the lab, the station crew will grab onto the capsule with the space station's robotic arm and berth it to the facility. "We're prepared to do whatever happens during our mission in terms of a visiting vehicle profile," Pettit said. "It looks like we are going to be longshoremen." Now that NASA's space shuttles are retired, the agency is hoping commercial spacecraft can fill in the gap, first to carry cargo, and eventually people, to the space station, which is set to operate until at least 2020. In the meantime, U.S. astronauts will continue riding on Russian Soyuz spacecraft until a private American alternative is available. Russian, European and Japanese automated vehicles will deliver cargo. The $100 billion, football field-size space station is a partnership between the United States, Russia, Europe, Japan and Canada. "I think space has been a sports arena," Kononenko said during a preflight press conference. "I think the future of space exploration belongs only to joint exploration, and we will be able to do deep space missions only if we cooperate together."